In this article, we'll outline the steps necessary for transferring a .com, .net, .org or .info domain from your current registrar (e.g: namecheap or godaddy) over to us. Other domain extension types (e.g: .fr, .cc, .co.uk) can be more complicated to transfer, so please raise a Support Ticket with us for advice on moving other domain extension types. Once your domain has been transferred to us, annual renewals and management of the domain will be made through your WPX Hosting admin panel. In terms of price, domain transfer costs the same as annual renewal, so it makes financial sense to wait until your domain has almost expired before moving it to us, such as in the last month of its current registration (but NOT in the last week before renewal, more on that below). The cost for domain transfer also includes 1 year of free domain registration so you will not need to pay for both the transfer and a year of domain registration. Also, domain transfer is different from a site migration (moving a whole website), which you can read about in this article. You need to have a valid EPP key from your current domain registrar for this domain. All of the above changes can be made in the domain control panel at your current registrar (the one you're moving the domain away from, such as namecheap or godaddy). If you do not have access to the above options at your current domain registrar, you will need to contact their customer support service to make the needed changes outlined above and have the EPP key sent to you as well. The final step is to confirm your transfer with payment and identfication information. Once complete, the domain transfer will begin. If you already have a hosting account with us however, please raise a ticket with us here and provide the domain name and EPP Code (supplied by your current registrar for the domain in question) in the Support Ticket. We will then generate an invoice in your account for that domain transfer however, the above steps must be completed (transfer lock disabled, etc) before raising the ticket with us. Shortly after the invoice has been paid, our registrar will send a Transfer Confirmation email to the email address listed in the WHOIS Registrant/Administrative contact and Authorisation email details. You must then accept the transfer by clicking a confirmation link inside the email. 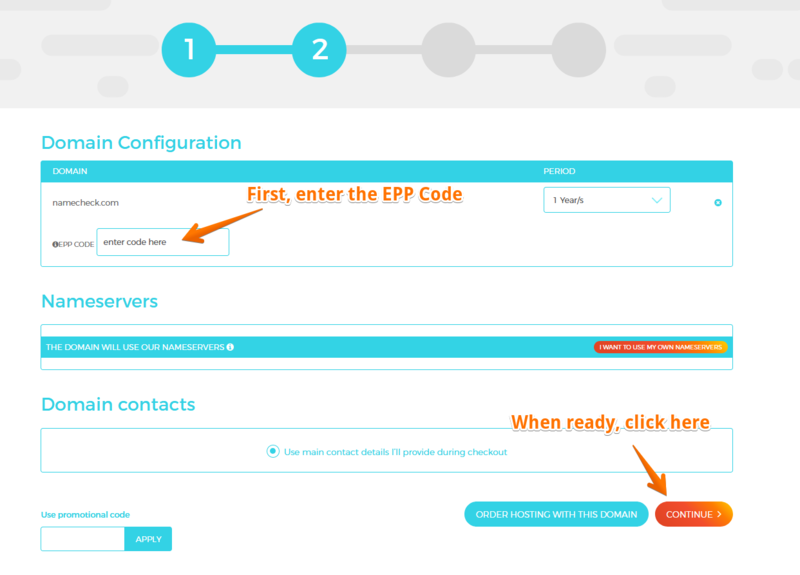 If the EPP code is correct, the transfer to WPX Hosting will take up to 7 days to complete, though the transfer is usually complete sooner. After the transfer of the domain to us is finished, you will receive a notification email from our admin system and you can then manage that transferred domain in your WPX admin panel. If the transfer procedure fails in one of the above steps, we will contact you to explain the failure (such as an incorrectly copied EPP code, missing information, transfer-locked domain, etc) and advise what to do next. After the necessary changes have been made on your end, you must then contact us again so we can restart the domain transfer again and ensure everything wil be working correctly. You can also check out our WordPress hosting in the UK here (we also have a CDN end point in Manchester too). More requirements for transferring your domain (find also on our Australian hosting here). Visit our promo discounts page and learn more about them. Find tips on how to speed up your website here. We have a CDN end point in Falkenstein too (visit our WordPress hosting in Germany here). See all results from Matt Woodward`s recent study. Read more WPX reviews on Trustpilot. See what our happy customers can share about WPX service and support. "I saved $600/year in hosting costs and they did all the site transfers for me."